Hydrangeas aren't difficult to grow, but watering the bushes enough and at the right time are important details that will ensure the hydrangea remains healthy and well hydrated, and the blooms big and beautiful. Even if the leaves wilt on a hot afternoon, moist soil will ensure that the blooms will look as good as new the next morning. Watering is especially important during the hydrangea's first few weeks, and will get the new bush off to a good start. Water a newly planted hydrangea bush immediately. Water deeply, soaking hydrangea and the surrounding bed by allowing a hose to trickle slowly at the base of the plant. 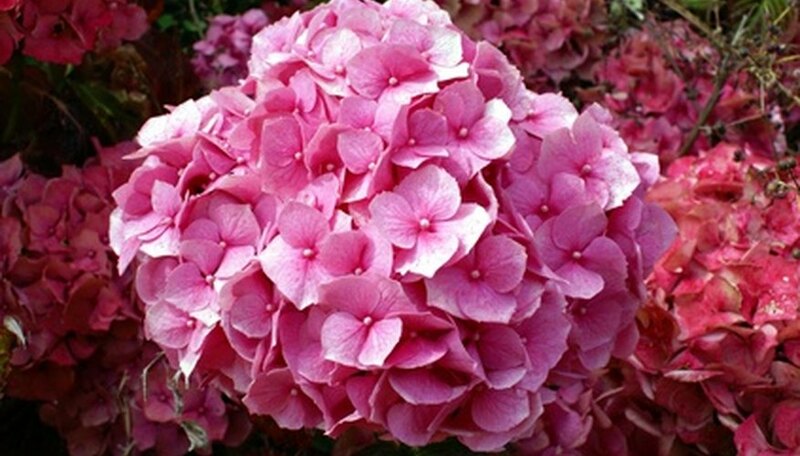 Irrigate the hydrangea deeply every three days for the first three weeks. After that time, water the hydrangea deeply when the soil feels just barely dry. While the soil should never be allowed to become bone dry, excessive moisture can cause the edges of the leaves to turn brown. Water hydrangea early in the morning so the moisture has plenty of time to evaporate before evening. Damp foliage during the night can invite pests, mildew and fungus. Spread 3 to 5 inches of organic mulch such as bark mulch, dry leaves or straw around the base of the hydrangea, but leave 4 to 6 inches uncovered around the trunk. Mulch will retain moisture in the soil, and will keep the soil temperature even. Check containerized hydrangeas daily, as the soil in containers dries quickly, especially during warm weather. Be sure the container has good bottom drainage so the roots won't stand in water. Bottom drainage is especially important if the hydrangea's container is exposed to rain. Nantucket Hydrangeas: Hydrangea Growing for Fun and Flowers!